Samsung has just unveiled a new high-end Exynos processor that comes with an enhanced NPU (Neural Processing Unit), and an LTE Advanced Pro modem supporting 2.0 Gbps downloads. Exynos 9820 is a tri-cluster octa-core processor with two custom Arm cores, two Cortex-A75 cores, and four Cortex-A55 cores coupled with an Arm Mali-G76 MP12, and manufactured using Samsung’s latest 8nm LPP FinFET process, which reduces power consumption by up to 10 percent compared to 10nm LPP process. 4×4 Multiple-Input, Multiple-Output (MIMO), 256-QAM (Quadrature Amplitude Modulation), and Enhanced Licensed-Assisted Access (eLAA) technology. 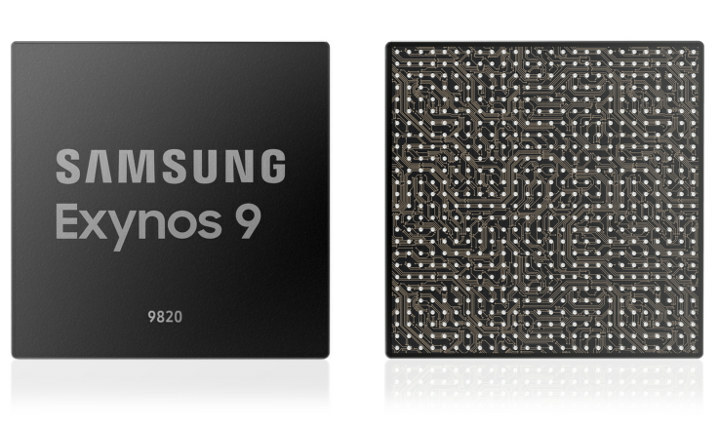 Beside the high-speed LTE modem, and 8nm manufacturing process, Exynos 9820 is the first mobile application processor to support the latest UFS 3.0 embedded flash storage with read speeds of up to 2.4 Gbps, and 8K video decoding and encoding. 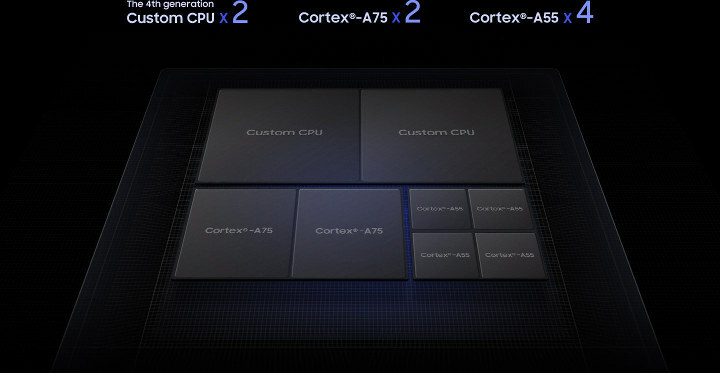 Compared to the earlier Exynos 9810, Samsung Exynos 9820’s new fourth-generation custom core delivers around 20-percent improvement in single core performance or 40-percent in power efficiency, while multi-core performance has increased by around 15 percent, and the Mali-G76 GPU cores deliver a 40-percent performance boost or 35-percent power savings. Mass production of the Exynos 9 Series 9820 should start by the end of this year, and should be found in the upcoming Galaxy S10 smartphone. Visit the product page for a few more details. Could this be a mongoose 4?.. Andrei from Anandtech seems to think so. Marketing-wise it’s excellent! It basically means “the topmost core our competitors use powers the medium cores in our CPU since we can do much better”. Even the image says it all : “look, two strong custom cores, and some uninteresting stuff below”. The uninteresting stuff is “just” a pair of A75 that many of use would dream to find on an affordable SBC! With the constant churn of smartphone SoC, it is a same these designs cannot be easily adapted to SBC or TV box in later years. Giving them a TV out etc, their old tech is still years ahead of budget SBC or TV box. I hope some of these upcoming notebooks will have Linux support. Something I alas doubt. If you’re ok with dual-booting or with GPU-less VMs, there’re several chrombooks on the market right now. Mind you the smartphone market is declining, just as the tablet market did. Samsung experiment with Dex for Linux desktop. While you can movie cast from your phone. What next a smartphone with TV box mode, you can answer and take calls on by Bluetooth while rest of family continue sharing the movie or show?